Over the past few weeks my World History students have been hard at work on research projects in class class, it was a project I had designed with concepts like Genius Hour and 20% Time in mind but I also knew that I was too far behind in the year to allow my students to just study anything they wanted as both those concepts promote. Students would reflect daily on their work. Students would have choice on what they researched (as long as it fell into the realm of World War II). Students would work on this only in class and would get ample time devoted to this task alone. Students would have total choice in the final product they created from their research. Even knowing that I was limiting their area of study to anything World War II was daunting, part of me worried there wasn't enough buy in, that students would not be able to find something they had a true interest in and the weeks spent on this project would be seen as a waste by my students or would truly be a waste with only superficial learning. Their daily reflections indicated they were learning, students were gathering a wide range of information on various aspects of the war. Some focused on radar technology, another student completed a psychological study of Hitler, one student looked at the environmental impact of the atomic bomb, and yet another looked at the social and emotional impact of the atomic bomb. The day the projects were due, students presented what they learned. The expectation was they would be prepared to present a 2-4 minute talk on their project answering four questions: what was their research question, what did they learned, what would they do differently if they could do it again, and what do they want to know now. They were not allowed to have a Powerpoint to show but they were encouraged to bring note cards with them to help them with their talk. While I had monitored and given feedback on their research throughout the weeks we had spent on this project, I was still blown away by how much students had to share during their talks. 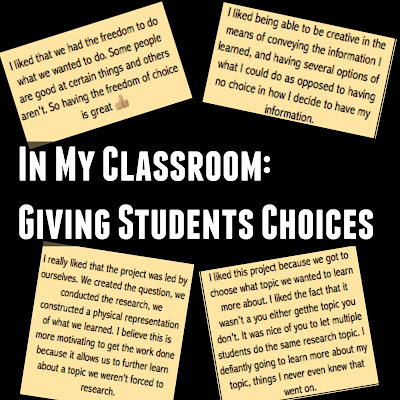 Students learned more than I had anticipated and their reflections on what they would do differently were thoughtful and honest. But the most exciting part for me was reading their final reflections because it became clear that their success on the project, their weeks of hard work, was all tied to the fact I let them make real choices. I liked being able to be creative in the means of conveying the information I learned, and having several options of what I could do as opposed to having no choice in how I decide to have my information. I liked how this project had a wide variety of how we could've presented our research. It gave us the ability to choose what would work best for us. It also allowed us to enjoy what we were doing. I liked being able to research with a partner. I also liked being able to choose what kind of project we did. I liked these things because it gave us the ability to be creative. I liked that we could look up what interests us and choose how we displayed our newly learned information. I liked learning new stories and information about the attach of pearl harbor. What I liked about this project was the ability to be able to pick my own topic to study. I liked this because I got to do what interested me instead of something i wouldn't of been excited about. I found it cool to see what others chose for their projects as well for ideas in the future. And my favorite part of all is seeing how much students owned their learning and felt proud in their work. I had a student design and bake a cake based on what she had learned, which is something I never would have thought of but is something that makes perfect sense for her since she is on track to attend culinary school. Students created beautiful paintings, one student wrote and performed a rap, another built a website, and yet another created a storybook. Almost every student displayed pride in their work, and the few who did not stated in their presentations that they had played it safe with their choices and wished they had created something they were more interested in as others had. You're probably wondering how I graded all these different projects on different subjects and that is what I plan to cover in my next post. 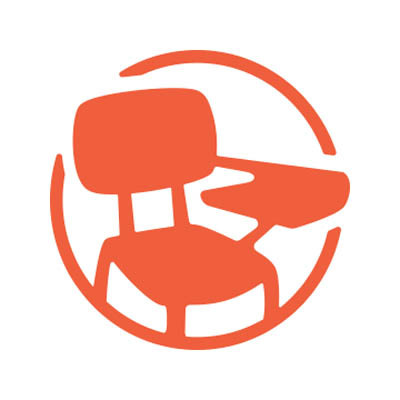 But for now, what are your thoughts on Project Based Learning? 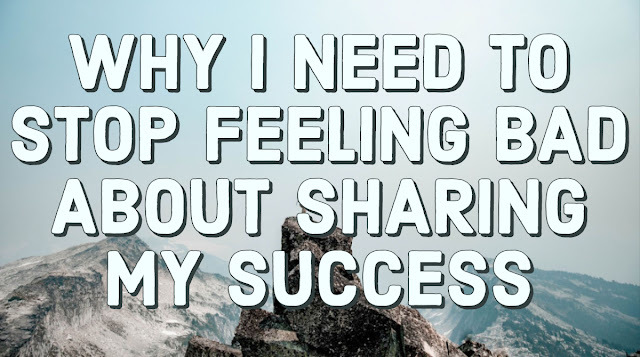 Share them in the comments! How do you grade? What is the purpose of grades? And what do grades actually mean? These are questions that plague me as I stare at stacks of work to grade and wonder if the grades I give truly serve me students the way I want them to. I've already read on the subject but still had more questions so I decided to focus my next reading on a book about Standards-Based Grading. Rethinking Assessment by Cathy Vatterott clearly explains what standards based grading is, how it can help our students and change our classrooms, and how to practically implement both on the classroom level and school wide. 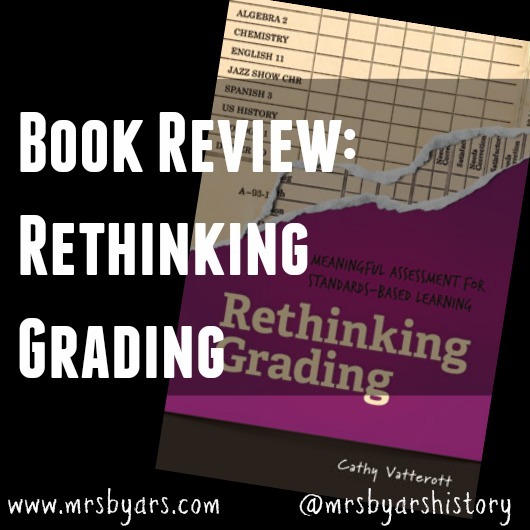 Throughout this book, she raised the exact questions I have been facing in my classroom and made clear and solid arguments for how adopting a Standards Based Grading practice could address those issues. The most compelling case made in this book is that we need to move away from compliance only classrooms. That by teaching compliance over valuing learning we do a disservice to our students and we create a culture of academic dishonesty as students only focus on getting the work done, not the learning. She isn't the first author to make this case and she wont be the last but she does an excellent job explaining the practice and it's benefits and gives real classroom examples (from various grade levels and subjects). I am a few steps closer to determining where I want to go next with grading in my classroom thanks to this book. Do you practice Standards Based Grading? Share your thoughts in the comments! When I started this year a colleague of mine was obsessed with #BreakoutEdu and she kept building these incredibly intricate lessons and showing pictures of students highly engaged in their work. During first semester, I had dipped my toe in the water by making a scavenger hunt that had some locked google forms that students had to open to get the next clue but they were mostly review questions and did not have the same elements of a true breakout. I knew I wanted to do something big to bring up morale and energy when students returned from Spring Break and I also wanted a lesson that was a mix of review and new information, to get students back into World War II after a week away. So I created by first Breakout lesson and it was amazing. Well, it's kind of like an escape room for your classroom but instead of having students locked in a room and trying to break out of it, they are trying to break into a series of bags and boxes that each have combination locks. The clues provided for the locks are where the educational part of this lesson kicks in, you can literally create a breakout for anything. To open each lock you create a series of clues or puzzles students must solve in order to get the combination. Originally BreakoutEdu was designed to have physical locks for students to open and it is easy to see the value in having a tangible item for students to unlock. It creates a hook; a new and different kind of challenge. I also know for my classroom a lesson would work best with ten teams of four students and I had a hard time with the idea of buying 60 locks to make 10 different kits. So, I mixed the concept of a digital breakout and a physical breakout. This allowed students to complete the puzzles and clues with their teams and still had the hook of having two physical locks each group had to get through. One was a backpack and that held 10 envelopes of clues (one per group) and the second was the final toolbox. If they got in the tool box, they "broke out" and got to celebrate with silly hats, noise makers, a photo op, and balloons. All other "locks" were on Google Forms with data validation so students had to get the right combinations before it would allow them to submit and give them the next clue. What did my students think? I graded students that day on their reflection from the activity and then their exit ticket was an Answer Garden poll where they were asked to describe the activity in three words. I exported the Answer Garden results to a word cloud generator to help me visually see what most students thought of the experience. Not every word is positive on here but the three largest words and the ones that were repeated the most in the survey were fun, interesting, and challenge. The majority of my students found the lesson challenging, exciting, fun and it kept their interest. This was clear to me as I walked around the room and while some shouted "THIS IS SO FRUSTRATING!" they all still returned to the challenge in front of them with a smile on their face. 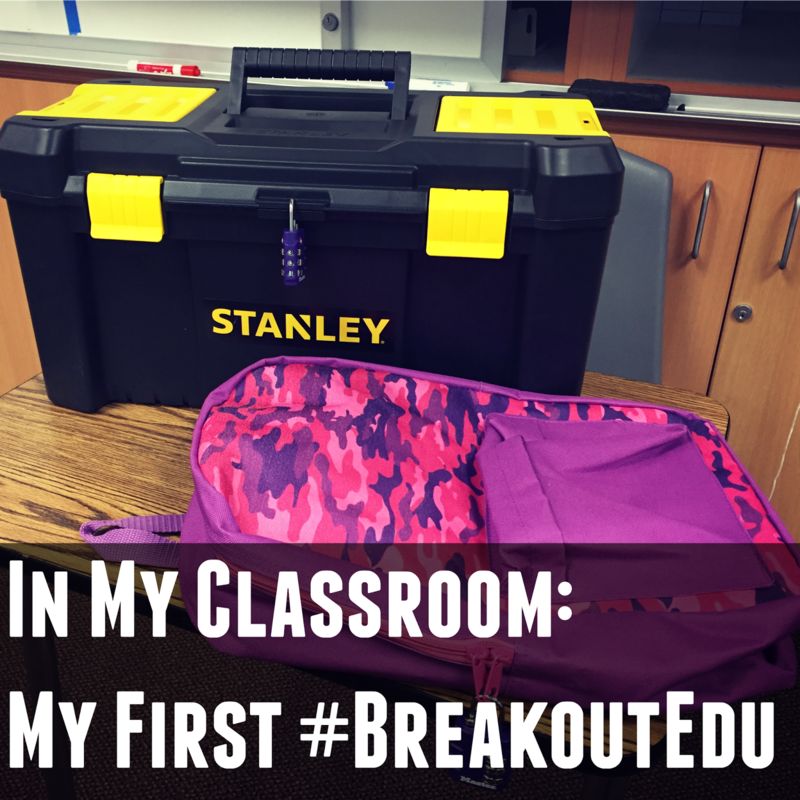 I did my first Breakout with my sophomore classes and plan to try it with my seniors in a few weeks. I'll be sure to update on how it went with a different age group but for now, have you done a Breakout? What did you like about it? What was challenging for you?